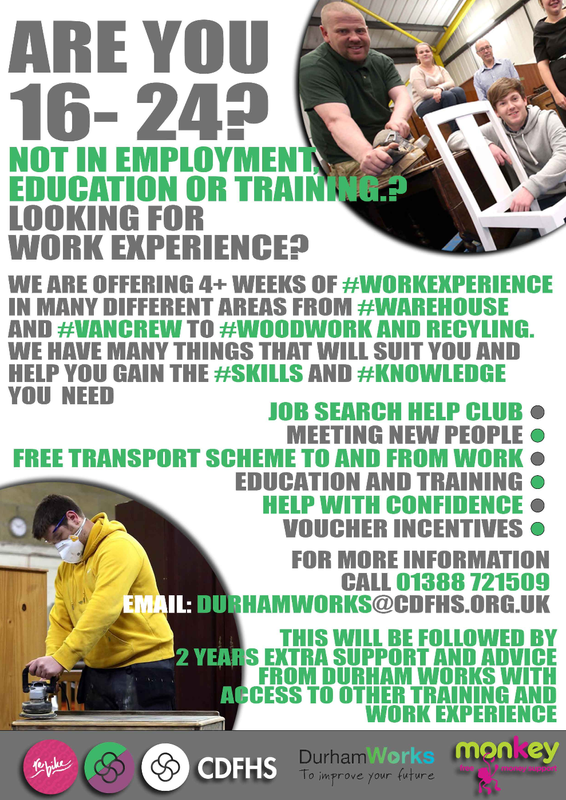 DurhamWorks is a partnership project between Durham County Council and multiple organisations working together to support young people who are not in education, employment or training. Durhamworks partners can give you information, support and guidance that will help you find opportunities near to you. Durhamworks partners check through hundreds of job and apprenticeship opportunities. Partners can find out what courses and training are available for you too. County Durham Furniture Scheme (CDFHS) is now operating as a commissioned provider to this project. We actively wish to engage with 16 to 24 year olds. If you are struggling to find employment, are not sure what training or learning you want to do. If you want to come along to the CDFHS and look at our services and support that is available through our Volunteer in to work programmes this may be for you. We will pick you up and bring you in to your volunteering. We will provide a cooked meal and refreshments throughout the day. We will manage your volunteering that you are treated fairly and given full access to any employment opportunities here at the CDFHS. See the brief quotes and success stories. We will also give you Â£40.00 incentive to join our programme, and upon successfully hitting some simple attendance and performance markers you will be rewarded.